A broken jaw is a break in the jawbone. To promote healing, you need to limit movement of your jawbone. These limitations require you to follow a soft, liquid diet. Meeting your nutrient needs can be a challenge with a broken jaw. To help you meet your needs, aim for six mini meals a day instead of three large meals, and use high-calorie liquids to boost your intake. Limit your intake of very hot and very cold foods, suggests Dartmouth-Hitchcock Medical Center. Choose high-calorie beverages for breakfast, such as milk and juice, to maximize your calorie intake and save low-calorie coffee and tea for when you can eat solid food. 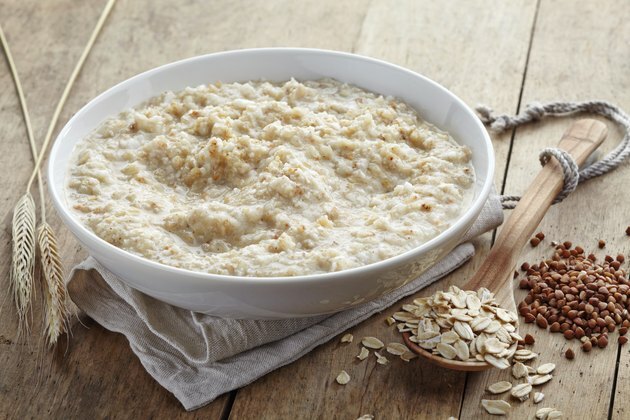 A high-calorie breakfast meal for a broken jaw may include 1 cup of blended hot cereal, thinned with 1 cup of whole milk or cream and sweetened with 2 tbsp. of brown sugar. Use a straw to sip fluids and help prevent irritation to your stitches, according to The University of Mississippi Medical Center. Include a variety of foods, including fruits and vegetables, to ensure you meet your entire nutrient needs. A fruit smoothie makes a healthy choice for people with a broken jaw. Blend 1 cup of fruit juice with one banana and 1 cup of strawberries, and add 2 tbsp. of peanut butter for extra calories and protein. Blended soups make a good choice for people with a broken jaw. Choose cream-based soups and strain or blend the soups if needed to eliminate chewing. To boost the protein content of your soup, add a jar of baby meat. A high-calorie soup lunch for a broken jaw may include 1 cup of cream of mushroom soup, blended with one 2 1/2 oz. jar of baby chicken meat. Thin your soup with heavy cream to the right consistency. Drink milk or juice with your lunch for added calories. Make a high-calorie peach flavored milkshake for your mid-afternoon snack. Blend 1 cup of whole milk, 1 cup of vanilla ice cream and 1 cup of canned peaches. You can blend any meal into a form you can tolerate with a broken jaw. Cook meat until tender and blend 3 oz. in a food processor or blender using au jus or gravy to thin the consistency to a tolerable level. Next, add 1 cup of peas for extra nutrition. Complete the meal with mashed potatoes thinned with heavy cream and butter. Use can take nutritional supplements to help you meet your calorie, protein and vitamin needs. Mix instant breakfast powder with whole milk for a quick evening snack or try one of the ready-to-drink nutritional supplements.